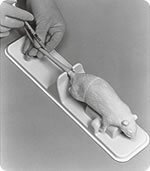 - Rat model for use in the training of animal testing techniques. 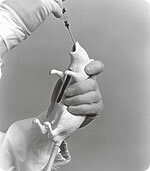 When various experimental procedures are conducted using laboratory animals, it is important to restrain the animal properly and to develop techniques that will meet the necessary experimental objectives. When an inexperienced laboratory animal handler holds a rat for the first time, there is a risk that the handler may be bitten or may accidentally drop the animal. Therefore, a training tool has been developed. The beginner can learn the techniques of proper holding of the animal, peroral feeding, tail vein injection and blood collection, and endotracheal intubations. The pharynx, larynx, trachea, stomach, and tail vein are anatomically correct and replicated in the rat model. The original silicone and soft vinyl chloride materials are used to achieve a texture similar to that of a live rat. When placed in the standard position, the resulting posture is the same as that of a live rat. Dosage in the stomach can be confirmed through the transparent section of the abdomen. 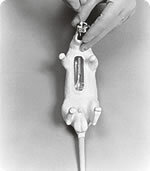 Needle insertion into the tail vein can be confirmed by the reflux of imitation blood.